It’s 12/24 Hours of Exposure this weekend. It’s moved from a trail centre in Scotland to a woodland park down near Reading, so I’m keeping my eye on the weather more than usual because if it rains it’s going to get muddy. I’m in the 12 hour event again, I’m preparing for Mountain Mayhem in a few weeks so a 24 hour solo race right now would wipe me out a bit. All standard stuff. Done it loads of times before. Apart from the fact that there’s a “fat bike” category in the 12 hour race this year, and I love a good long ride on a fat bike, me. 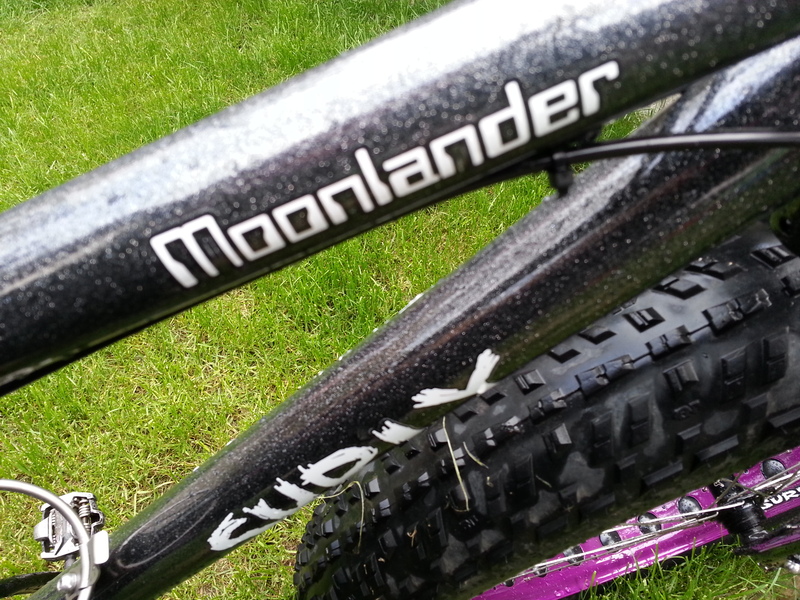 So, I’ll be riding a Surly Moonlander, kindly lent to me by Rich and Shona at Keep Pedalling in Manchester. I honestly wouldn’t contemplate riding for 12 hours straight on a steel framed, rigid bike with 4 inch tyres if it wasn’t such a massive load of fun. 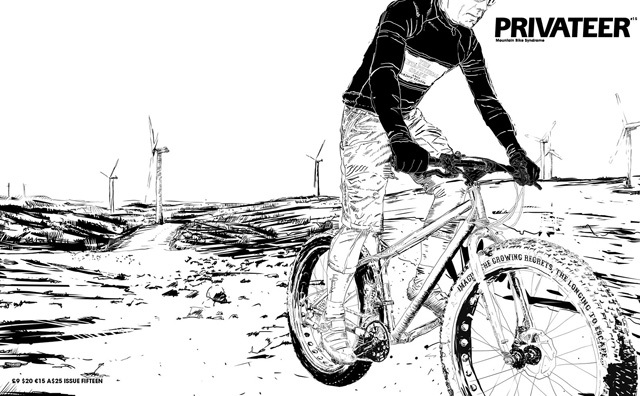 Ever since I rode Mountain Mayhem last year on the On-One prototype fat bike I’ve loved the idea of doing Big Stuff on them, so when the opportunity came to ride a 12 Hour race – the UK and European 12 Hour Championship in fact – on a shiny new Moonlander with purple rims, I jumped at it. I’ve been riding it for the past week or so, making adjustments to it – wider bars, longer stem, carbon seatpost for saving weight 😉 and I’ve loved every ridiculously grippy, drifty, boingy minute of it. 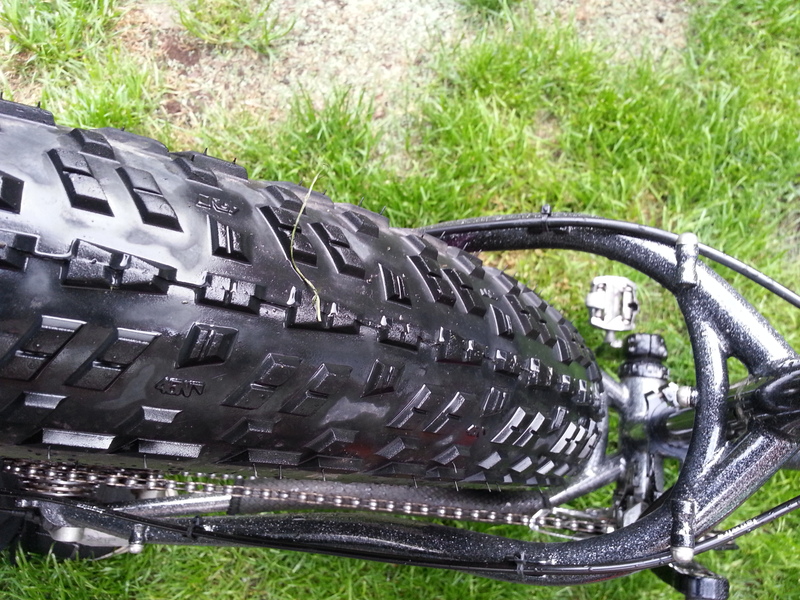 It’s fast too – the riding position, now I’ve made some adjustments, is fairly racy and the 45Nth Husker Du tyres are quick to accelerate. I’ve no idea yet if they’re any good in slippery mud, but hopefully there won’t be too much of that. 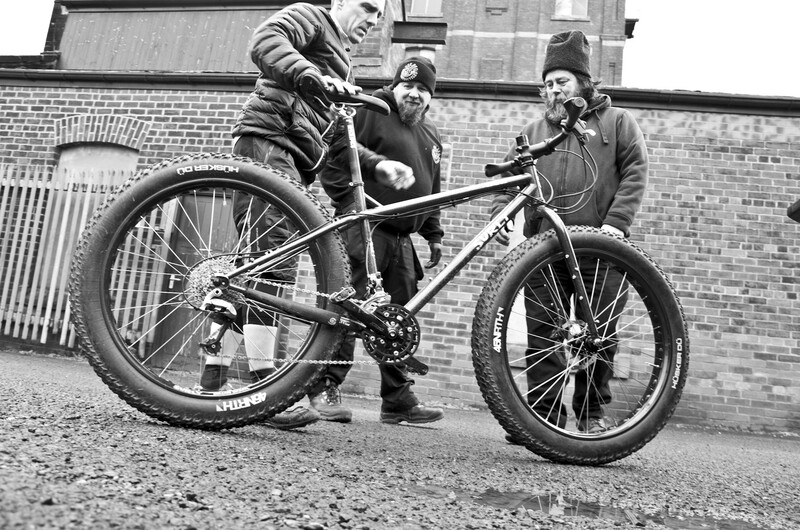 You need a bit more weight-shifting and “body English” to manoeuvre the bike at speed – it’s pretty heavy at “somewhere above 36 Ibs” – but it rides very light and doesn’t feel as heavy as it really is. If that makes sense. Oh and it’s got one of the coolest paintjobs ever, called “Space”. 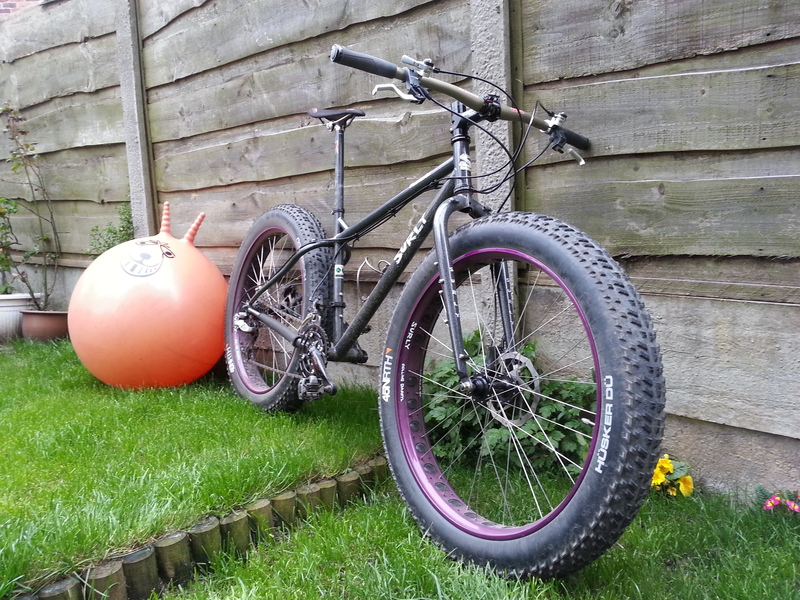 4″ tyres and tons of room to spare…. This isn’t the first time I’ve borrowed the Moonlander. 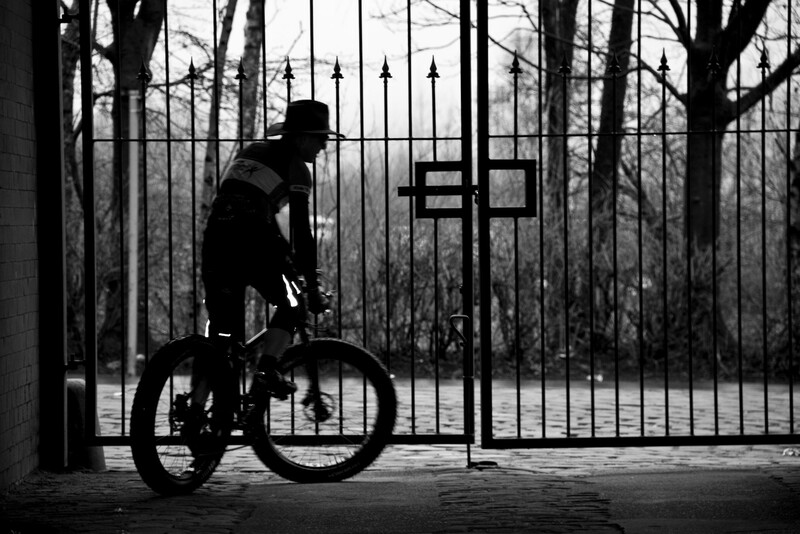 A few weeks ago Warren and I took the bike up into the hills and around the back of some local satanic mills and took some photos that will appear on the front cover and as part of a feature in the next issue of Privateer Magazine. You’ll soon be able to buy some of the artwork from Warren via hit Twisted Head Press website, if you fancy a picture of me on your wall. And why the hell wouldn’t you?